Adopted as the official book of the International Year of Astronomy (IYA) 2009, this stunningly illustrated history of telescopic discovery spans the range from the first telescopes via the Hubble Space Telescope to next generation platforms, and how they have changed and continue to change our view of the universe, our place in it and where it all came from. EYES ON THE SKIES features numerous full-page photographs and is printed in high-quality color throughout. 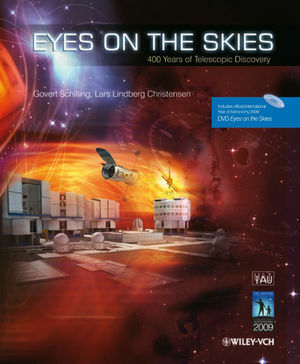 Also includes the official IYA DVD with 59 minutes of narrated text, expert comments and interviews, animations, computer simulations, science results, plus footage from observatories. Lars Lindberg Christensen is press officer of the International Astronomical Union, as well as IAU EC International Year of Astronomy 2009 Working Group Secretary. An astronomer by profession, he is a science communication specialist heading the Hubble European Space Agency Information Centre group, responsible for public outreach and education for the NASA/ESA Hubble Space Telescope in Europe. Robert (Bob) Fosbury is an astronomer working for the European Space Agency (ESA) as part of ESA's collaboration with NASA on the Hubble Space Telescope (HST) project at ST-ECF. Bob also served on NASA's Ad Hoc Science Working Group and ESA's Study Science Team as they developed the instrument concepts for the James Webb Space Telescope, the next generation space observatory. Bob and Lars wrote the highly successful "Hubble - 15 years of discovery". Robert Hurt is professional artist, specialized on art in astronomy. Eyes on the Skies Visit for more about the authors and sneak previews of the books accompanying DVD!